As a social enterprise, Livewell Southwest has a social, ethical and moral responsibility to reach out to all sections of our community to do our bit to reduce social inequalities that exist. Offering paid work placements helps us to do this, by giving people who are long-term unemployed and from a challenging background the opportunity to get back into paid work. Some of our successful paid work placement candidates are people who have volunteered with us and we can see have potential, or who have applied for apprenticeships but need a bit more support to succeed. There’s an application process, and following that if an initial trial period of four weeks is successful, the position will continue for a six-month fixed term period. During that time the person will be paid and will have all the benefits of working for a respected organisation, learning or re-learning skills, building confidence and being valued. We work closely with external organisations like Job Centres, housing associations and military to civilian transition services to improve social inclusion for people who would otherwise be left behind in the labour market. 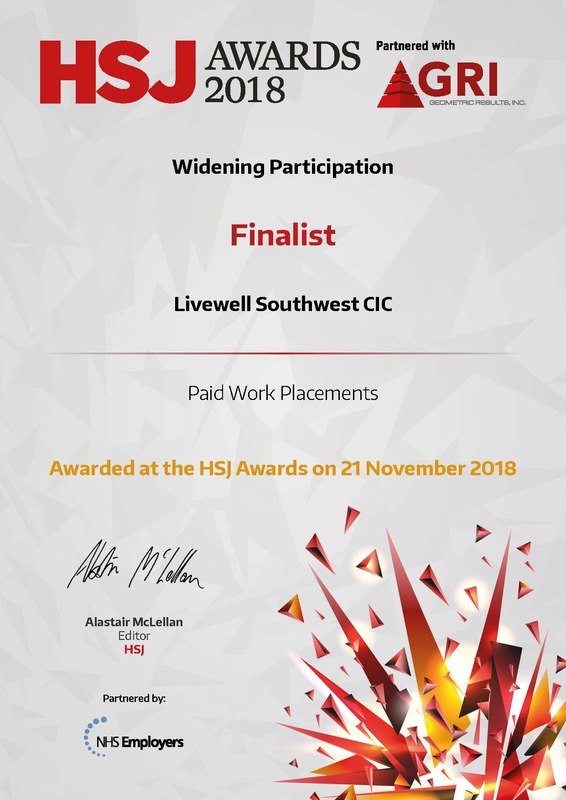 Our innovative Paid Work Placement scheme was shortlisted in the new ‘Widening Participation’ category at the HSJ Awards 2018. Ginnie Stiff, recruitment manager, and the team attended an awards ceremony in London to represent Livewell Southwest and the fantastic work undertaken through the scheme. “The Paid Work Placement scheme seeks to reach out to those in our community who are long-term unemployed or who come from a challenging background to support them into getting back into paid work. “Through the provision of learning new skills while being paid, this in turn helps boost individuals’ confidence and sense of purpose in their community. We work closely with housing associations, job centres, charities and military to transition services to involve those in our society who are most vulnerable and often get left behind.